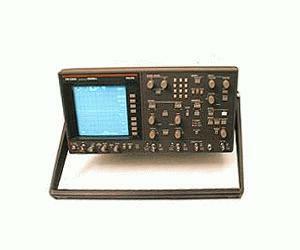 The Philips / Fluke PM3320A is a Digital Storage Oscilloscope with 250 MS/s Sampling Rate and a Bandwidth of 200 MHz. 4 ns horizontal resolution per channel at single shots. 10 bit vertical resolution. 4 k deep memories. Horizontal expansion up to 64 times. Cursor measurements automatically including probe factors, amplitude-, time-, frequency-, and phase measurement.